For the first half of Supergirl Season 1, Hank Henshaw was simply the head of the DEO whose life was dedicated solely to protecting Earth from alien threats. However, it was revealed in “Human for a Day” that the real Henshaw was dead (supposedly), and the individual who took his place is longtime DC hero J’onn J’onzz, a.k.a. the Martian Manhunter. Now that his true identity is known, Supergirl will be delving more into the Martian’s past, and when the show returns from its hiatus next year, some light will be shed on why he is the Last Son of Mars. We have a visitor from another planet who’s a White Martian. There are two Martian species — a Green Martian species and a White Martian species — and the White Martians, in our story, are responsible for the death of the whole of the Green Martians. Originally in the DC universe, Mars was home to three species of Martians: Green, White and Yellow. While the Green Martians were peace-loving, the White Martians were bloodthirsty warriors. The two species were eventually drawn into a civil war with one another, and the few surviving White Martians were subsequently banished. While not all White Martians are evil (just look at Miss Martian), most of their kind have continued their warmongering ways after Mars’ death and targeted Earth on many occasions, either attacking it directly or infiltrating our society disguised as humans. 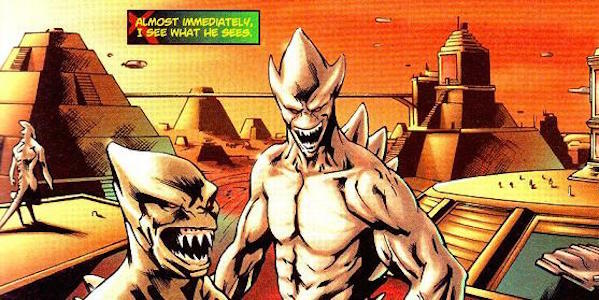 Outside of the printed page, the White Martians were heavily adapted for Justice League, featured on Young Justice, and glimpsed in a flashback during the movie Justice League: Crisis on Two Earths. In the short time she’s been fighting crime in National City, Kara Zor-El has battled a variety of opponents, from fellow Kryptonians to enhanced humans to androids. However, she has yet to go up against a Martian, whose powers include super strength, flight, telepathy, shapeshifting and more. If she does battle with it (which is more likely than not), her big advantage may come from the fact that all Martians, no matter what their color, are vulnerable to fire. It’s also possible that the White Martian’s appearance will force J’onn to deal with it personally. In the process, this may result in him inadvertently showing Kara he’s not really Hank Henshaw, a reveal we know will come eventually. Supergirl will return from its winter break Tuesday, January 4 on CBS.